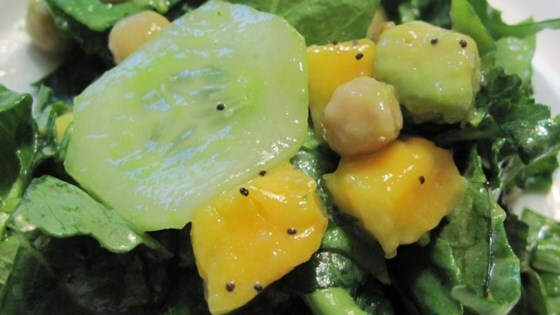 "This is a delicious summer salad. Great as a dinner salad with some grilled chicken or fish, or as a side. This is my first experience with kale, and I'm hooked! Add nuts (walnuts, cashews, slivered almonds), sunflower seeds, or dried fruit (cranberries or cherries) for some added texture and deliciousness! I also like to add thinly sliced red bell peppers or Shepherd peppers; it is a salad, anything goes! The citrus vinaigrette is light and refreshing. Sometimes I want a sweeter vinaigrette, hence the addition of marmalade. Apricot would work well, too. A great summertime salad." Place kale in a large bowl and gently massage it with your hands until slightly tender, 2 to 4 minutes. Let kale rest to tenderize further, about 10 minutes. Stir avocado, mango, chickpeas, and cucumber into kale. Combine olive oil, vinegar, orange juice, sunflower seed kernels, mustard, poppy seeds, and marmalade in a jar with a tight-fitting lid; put on the lid and shake until dressing is well combined. Pour dressing over kale mixture and toss to coat. You can use any oil in place of olive oil. A very good, gentle tasting salad. For me, I would prefer a bit more bitterness in the dressing, but for my family it was perfect. I didn't tweak this delicious salad at all! It made a lovely supper on a hot summer's evening. Thanks for sharing Weeble!